Velkommen til "Vår video verden"
Vår målsetting er å gi profesionell rådgiving samt levering av høykvalitets video utstyr, samt å yte god service ved prosjekter innenfor videoovervåking av industrianlegg, veg og trafikk-anlegg, kaianlegg o.s.v.. Vi vil også gi informasjon og veiledning om valg av produkter til spesifikke oppgaver innenfor videoovervåking. Vi følger nøye med i utviklingen og prøver til enhver tid å tilby våre kunder det best egnede utstyr som er tilpasset deres spesifikke behov. You can easy to monitor in/output resolution, cable length and eye-pattern at once. 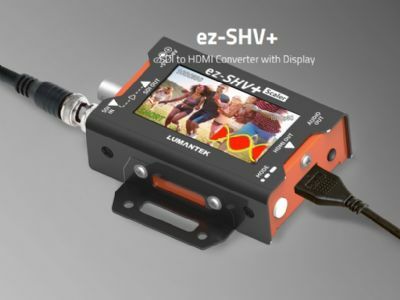 LUMANTEK`s ez-SHV+ has a SDI LOOP output. Through the LCD screen, you can monitor incoming video. By using the `dip switch`, you can select the resolution from 480i to 1080p. You can also control the LCD Brightness and screen ratio. Hey rack builders and service engineers! How much do you like wall warts and small devices? How much do you love it when you have one small device like a transmitter, scaler, DA, etc. fail and in order to get it out of the rack you have to cut 50 cable ties, wipe the blood off of 4 new scratches and pray that you haven`t unplugged anything by accident? 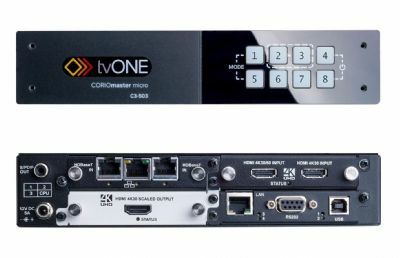 tvONE has developed a universal rack mounting system for any and all manufacture`s small devices. Different sizes and Different voltages! It even cools them! Throw away the wall warts! Comes in three sizes, 4RU, 5RU, 6RU. It`s called the ONErack. Click here to visit our You-Tube page featuring ONErack instructional videos. 12.10.2016- Les Nyheten Hey rack builders and service engineers! How much do you like wall warts and small devices? How much do you love it when you have one small device like a transmitter, scaler, DA, etc. fail and in order to get it out of the rack you have to cut 50 cable ties, wipe the blood off of 4 new scratches and pray that you haven`t unplugged anything by accident? tvONE has developed a universal rack mounting system for any and all manufacture`s small devices. Different sizes and Different voltages! It even cools them! Throw away the wall warts! Comes in three sizes, 4RU, 5RU, 6RU. It`s called the ONErack. Click here to visit our You-Tube page featuring ONErack instructional videos. Portalis - Felles kontroll av mange PC`er. 27.01.2015- Les Nyheten Elegant Connectivity The pro-xi system appears to each of the client computers as a traditional keyboard, mouse and video monitor — the most simple and elegant connectivity mechanism possible. 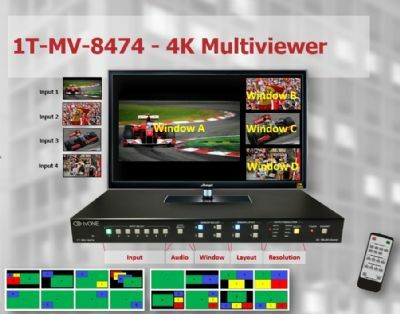 21.02.2014- Les Nyheten C2-2855 Universal Scaler PLUS is first in a new generation of high performance scalers that provides best-in-class video scaling and format conversion along with revolutionary, intuitive user interface tools. 13.11.2013- Les Nyheten The new CORIOmaster mini fits up to 12 High Density Universal DVI or HDBaseT ports within a breakthrough 1 RU frame.